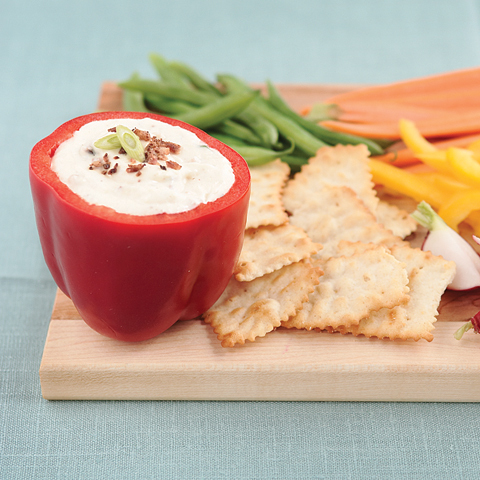 Makes 16 servings, one topped cracker (27 g) each. Pierce potato with fork; place in small microwaveable bowl. Microwave on HIGH 5 min. or until tender. Mash potato with potato masher or fork until smooth. Add cream cheese spread, syrup and salt; mix well. Spoon evenly onto crackers. Top each with a pecan half and cranberry. Serve warm. Special ExtraFor an attractive presentation, cut small piece from one of the bottom corners of small resealable plastic bag. Insert star tip in hole. Fill bag with potato mixture; seal bag. 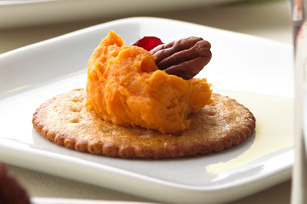 Use to pipe potato mixture onto crackers before topping with pecans and cranberries as directed.